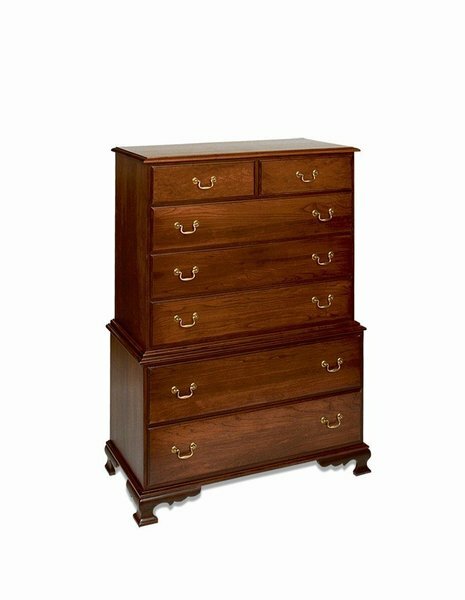 This Amish handcrafted Colonial Chest of Drawers has the feel of an 1800's original. It looks beautiful with our Pencil Post Bed or Rice Bed. Choose from solid cherry wood or oak wood as well as a variety of finish samples. If you are looking for other wood types to match to existing furniture give us a call at 1-866-272-6773 and we can provide you with a quote. Many of our clients like to have our colonial furniture made in tiger maple wood. You can select from our popular Chippendale hardware or a more conservative brass bail. The drawers on this Amish Chest of Drawers are dovetailed for years of everyday use. Wood drawer slides are standard but you can upgrade to full extension as well as soft closing slides. This Early American furniture is sure to become a treasured family heirloom. Please allow six to twelve weeks for this Amish Chest on Chest to be handcrafted just for you!